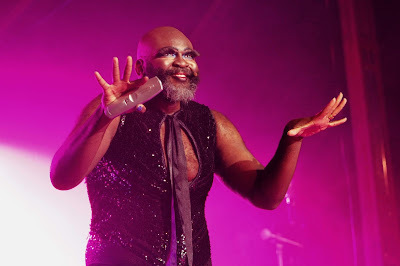 Sydney Festival presents, LE GATEAU CHOCOLAT: ICONS, in the Magic Mirrors Spiegeltent, Festival Gardens, Hyde Park. 23-27 January. Le Gateau Choclat is sumptuous in size and presents as a beautiful, bearded baritone gay 'drag queen' of Nigerian origins. He uses his own rich and expressive voice, nicely and sensitively micro-phoned by his Sound Designer, and it can be certainly thrilling in its range of note as he moves between public and private personas to sing about love, heartbreak and identity. There is witty verbal and physical anecdotal 'patter' between songs, while indulging in grotesque costume changes of a decidedly poor man's imaging of the Grace Jones-look - there are a few glitzy coverings usually topped with a deliberately ridiculous, architectural head piece - hat. It felt ironically self-deprecating. The audience I saw this performance with were avid fan boys and girls of all ages and responded to the performance with that special love that fan boys and girls have - both audience and performer flattering each other with the rapport - they loved the concluding sing-along of a Whitney song. As a new comer to Le Gateau Chocolat I was not so easily wooed and felt that I was watching a performer using the construction of his show as a mediative abreaction, an enacted therapy session, which we were invited to witness, for, the events of his life scripted tended to dwell in a heart-felt melancholia, producing resonant vibrations of, mostly, angst. I found it a little uncomfortable, indulgent, to be part of. It was no accident, I thought, that Le Gateau Chocolat reached into the opera potential of his voice (it was a little unsteady) and quoted an aria from Ruggerio Leoncavallo's opera PAGLIACCI (1892) - the story of a circus clown that has been duped, cuckolded - the aria of a sad clown. 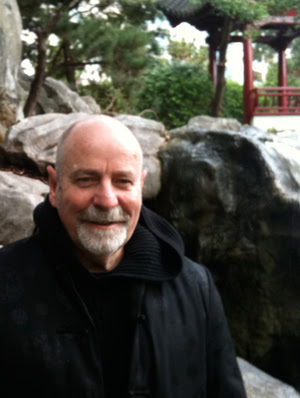 The aria, in the opera leads to murder and tragedy. There was an air of unresolved, and artistically unimpeded, depression emanating from the performance persona - a piercing inner grief not really disguised by a deliberate effort of a distracting comic garb - his little blue dunce's cap perched precariously on that vast dome of manliness. The repertoire of the performance stayed in similar and constant territory. and tone. Last week in the Spiegeltent I was moved by PAUL CAPSIS who gave his all to his audience. This week with Le Gateau Chocolate I was not moved much and felt that perhaps I needed to have seen his last show he gave at the Sydney Festival to truly appreciate the rapture of his audience around me. He just didn't really take off. Maybe, he was distracted by the intrusive noise of the Road Works drilling not to far away from the tent. Whatever! It was, relatively, an oddly enervating - draining - night. The older couple beside me asked what I had thought. I replied, "Comme ci comme sa', wavering my hand in gesture. They looked, gently, disappointed. I added, "He has a wonderful voice". They relievedly smiled at my stab at positiveness and I was able to extricate myself out of the tent without spreading my 'so-so' appreciation any further - fans are fans, and can be zealots of defence.